RALEIGH, N.C. (AP) The season is getting away from North Carolina State. The Wolfpack entered Atlantic Coast Conference play with the potential to mature into a scary March matchup. Instead, North Carolina State is near the bottom of the league, losing by lopsided margins and creating uncertainty about the future of sixth-year coach Mark Gottfried entering Wednesday’s rivalry game against No. 10 North Carolina. 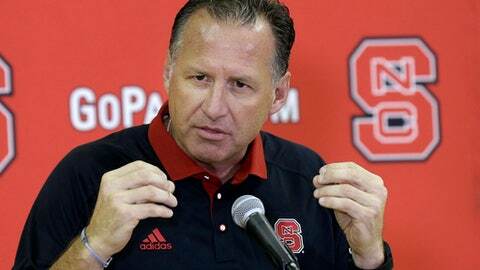 ”I don’t know that I’d ever use the word desperate,” Gottfried said after Tuesday’s practice. ”I don’t think there’s any question your backs are pinned up against the wall. We’ve been there before, since I’ve been here. But in the past our teams have always played its best basketball at the end. We’ve always done that. No one expected this from the Wolfpack (14-12, 3-10 ACC). N.C. State had an overhauled roster that included the addition of potential one-and-done point guard Dennis Smith Jr., but the team picked to finish sixth in the 15-team ACC is ahead of only one team in the standings – a Boston College squad that beat the Wolfpack last month. More alarming is the way N.C. State has gotten there. There was a 107-56 loss against the league-leading Tar Heels (21-5, 9-3) in Chapel Hill, the second-worst margin of defeat in program history. A 25-point loss at Louisville. A 24-point loss at Florida State. And last weekend, there was an 88-58 loss at bubble team Wake Forest, an ugly afternoon that included senior center BeeJay Anya jawing multiple times with heckling Demon Deacons fans behind a nearby baseline. On Tuesday afternoon, UNC point guard Joel Berry II echoed that even as he tried to say Wednesday would be a tougher matchup. ”We can’t go out there and think they’re going to lay down like they laid down the first time,” Berry said. N.C. State has lost four games by at least 24 points for the first time since the 1993-94 season after having just three such losses in Gottfried’s first five seasons combined. Offense generally hasn’t been a problem, and Smith has been a brilliant individual talent who has become the first player in league history to have two triple-doubles in conference play in the same season. He was dominant with 32 points in the Wolfpack’s 84-82 win at Duke’s Cameron Indoor Stadium on Jan. 23, the program’s first win in the famously hostile building since 1995. But N.C. State hasn’t won since, losing five in a row. The biggest culprit for N.C. State’s troubles has been defense. It ranks 216th nationally in KenPom.com’s adjusted defensive efficiency ratings (106.8 points allowed per 100 possessions), the worst in the ACC and better than just five teams from power-5 conferences. Gottfried inherited a program that had missed the NCAA Tournament in the 15 of 21 years since the Jim Valvano era, then got the Wolfpack to four straight NCAA bids – including a pair of Sweet 16 appearances. But last year’s team stumbled with a shorthanded roster, and this year’s descent seems to be picking up speed with only five ACC games left. ”That’s been a tough thing for us at times, where we allow adversity to kind of steamroll us and it gets worse,” Gottfried said. ”And that’s happened too many times. And in those games where we’ve had lopsided losses, at the end of the day that’s my responsibility. AP Sports Writer Joedy McCreary in Chapel Hill contributed to this report.